This is an A5 card using Sue Wilson's Australian Dies, the Camelia complete Petals,also by Sue wilson and an embossing folder from Die'sire, I think it was called Polka Dots. I started by cutting the design into a piece of White card measuring 10.5cm x 15cm, and backed this onto a card I had in my stash, which had been created using the Shaving Cream technique. This was layered onto a 12.5 x 16.5cm white card card which I had put through my Xcut Xpress Craft Machine, and the Polka Dot embossing folder, and coloured using distress ink and and a sponge. The center panel was cut twice, using both the diamond pattern and the outer cutting die. I then embossed one of the pieces and coloured it using the same distress ink, before gluing them together to give some depth, and attached this to the card using dimensionals. These layers were then added to the A5 card. For the Flowers I used the Camellia open petals dies in four sizes using white copy paper, coloured with the same distress ink. I then cut the tops off each petal and cut down to make a fringe. I then formed each flower using 3 or 4 sizes. After gluing them together I sprayed them with a little water, and whilst the were damp I shaped the flowers. These were then added to the card, along with the leaves, which I left white, and I added small pearls to the center of each flower and the 4 corners of the second layer. The sentiment was from another die, not sure where this came from. 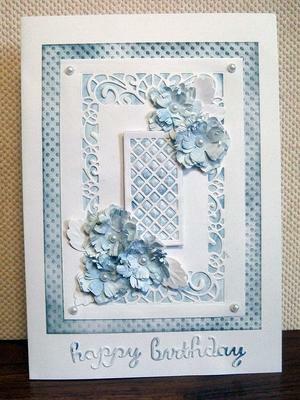 I cut it out twice and glued them together before adding to the card. What a beautiful card. I love the colour scheme you have chosen and find it very pleasing and soothing. Hi Margaret. What a lovely card! The extra care you took with the flowers were well worth it! I'm sure the recipient absolutely loved it! Well done. I hope we get to see more of your creations. Enjoy your day.